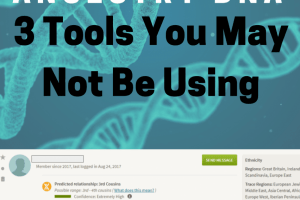 What are you doing with your Ancestry DNA matches? Are they just sitting there waiting for some action? If you haven’t yet explored the surname search capabilities of the website you’re missing out on a valuable tool. Let’s take a look at how a simple surname search works and discover what it can do for you. 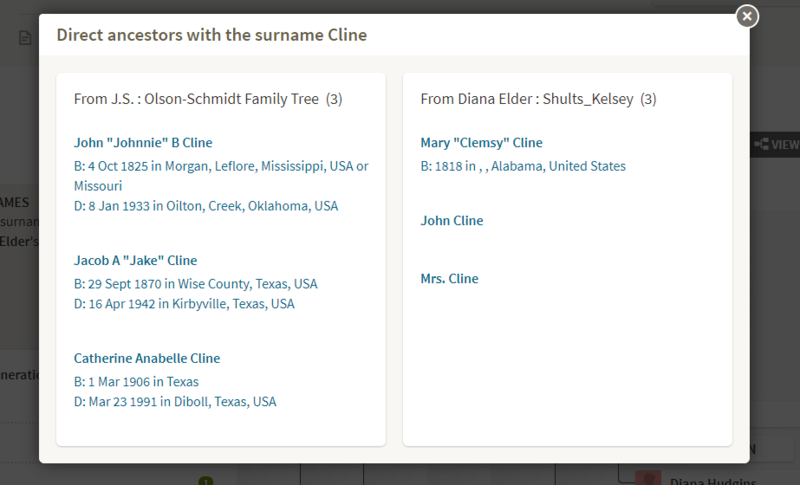 Because a picture is worth a thousand words, I’m going to guide you through this process with screenshots of my own search in my DNA results for the surname “Cline.” My 4th great grandmother is Clemsy Cline, born 1818 in Alabama, lived in Missouri and Texas. Female lines are difficult to trace and this is no exception. I have found Clemsy only in the census records of 1850, 1860, and 1880. I have her surname from her daughter’s death certificate and that is all I know. Can DNA help me discover more? Let’s find out. 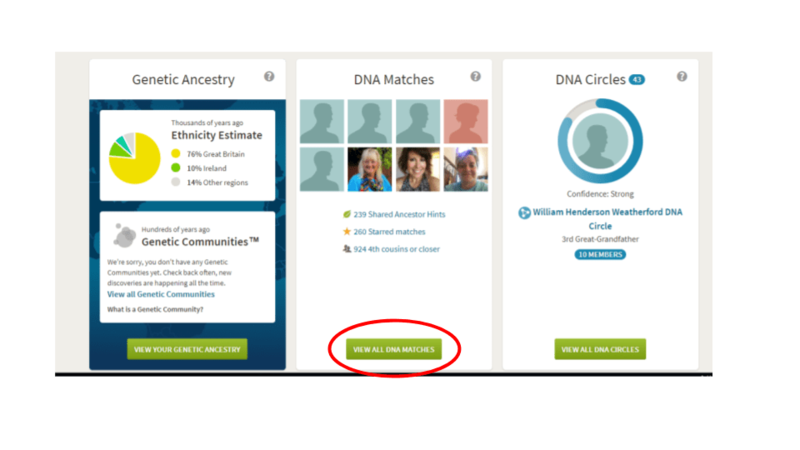 From the Ancestry DNA home page, I click the green box, “VIEW ALL DNA MATCHES” which takes me to a page with my Ancestry DNA results. My Ancestry DNA results include 1000+ 4th cousins or closer. That is an overwhelming amount of matches to sift through. I need a way to filter those and narrow my search. Notice the blue box below with the magnifying glass titled “SEARCH MATCHES.” Clicking that takes me to a search box where I can search by surname or birth location. Searching by surname allows you to quickly find those matches with a common surname between your tree and theirs. This weeds out those matches without a tree and lets you immediately sort through a smaller pool of possibles. I enter “Cline” into the search box below and leave the birth location blank. I want to do my own filtering for birth location. I click the green “SEARCH” button and await my results. With the surname of “Cline” entered as a filter, I now only see DNA matches who also have a surname of “Cline” in their family tree. This does two things. 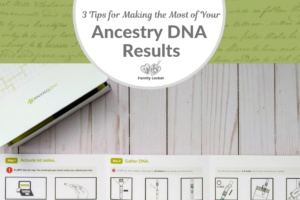 First it eliminates those matches without an Ancestry family tree – remember to make the most of your DNA results, you need to build a tree on Ancestry. Being able to view my cousins’ trees helps me make important connections. Second, I now only have four pages of results to search through, much more manageable than my starting total of over 1000. From the results page I now can click on the green box “VIEW MATCH” shown below. Notice that the tree I chose first includes over 19,000 people. This tells me that this cousin has done a fair amount of research. I’m really interested to see what “Clines” his tree includes and if they match with my Clemsy Cline. When I click on “VIEW MATCH” I see my DNA cousin’s tree and our shared surnames. “Cline” is there as well as a few others. I click on each of the shared surnames to see if any of them are possible ways that my DNA cousin and I share DNA. I rule out each of them based on location and time. I am looking for surnames that are in similar locations and time periods. The only other one that is a possibility is “Hubbard” but the match is early 1700’s which makes a DNA connection less likely. Clicking on the shared surname of “Cline” shown in the image above, lets me compare the individuals from my tree with those of my shared DNA match. Now I can evaluate the likelihood of a connection. I see that my DNA cousin’s tree includes a John B Cline born in Missouri. My Clemsy Cline also lived in Missouri and moved to Texas. Could this be a brother or cousin? I can click on any of the individuals, including those from my own tree and see the highlights of their life. From there I also have the option to view the full tree. Now that I’ve discovered a Cline connection, I could contact my DNA cousin and work together on this challenging line. I continue looking at each Cline match from the surname search and take notes of those that are likely connections. I’ve started a spreadsheet with my DNA matches and as I figure out the connection I record it. For this surname search, I’ve added a column for the surname “Cline” where I enter in the matching individuals from my DNA cousins’ trees. This lets me start seeing patterns. Looking at several matches, I begin to see the name John Cline born 1795 in Virginia appear on multiple trees. This is a name I’ve looked at before as a possible father to my Clemsy Cline. With DNA hinting at the possibility of a connection, I think I’ll explore his and her records further and see what I can find out! 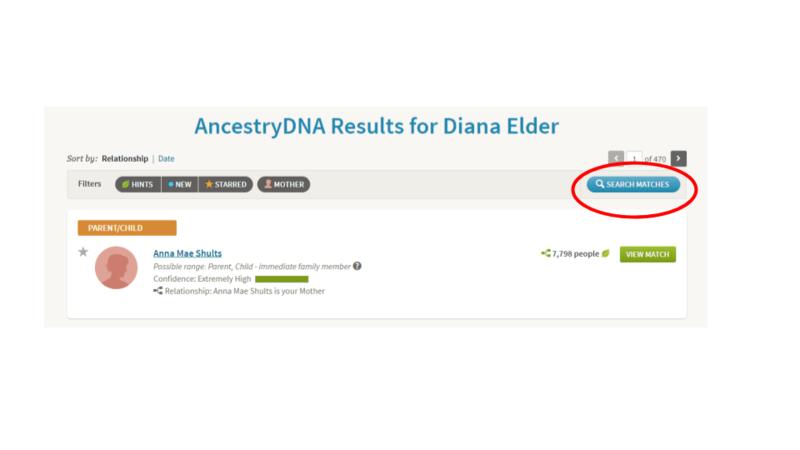 If you have a brick wall ancestor, discover your DNA connections with a surname search. You may be pleasantly surprised with what you find. Best of luck in all of your DNA family history adventures! 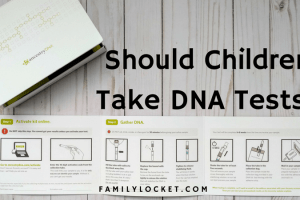 Should Children Take DNA Tests? That’s a great question! I love to discover the stories of my ancestors and DNA can definitely help us find those ancestors.